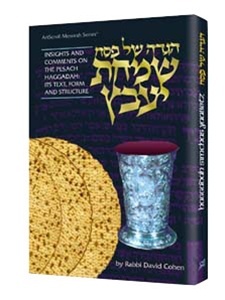 Insights and comments on the Pesach Haggadah: Its text, form and structure. What is the Haggadah? The centerpiece of the Seder -- yes. A collection of stories, interpretations, and praises -- yes. A springboard for ideas and hopes -- yes. Such a person is Rabbi David Cohen. He is a scholar, teacher, thinker, author, posek. He is guide, counsel, friend. He is a complete talmid chacham. Such a person is capable of plumbing the subtleties and nuances of the Haggadah and bringing to bear upon it the full spectrum of Rabbinic thought and literature.